Distinguishing four sources of power – ideological, economic, military and political – this series traces their interrelations throughout human history. This fourth volume covers the period from 1945 to the present, focusing on the three major pillars of post-war global order: capitalism, the nation-state system and the sole remaining empire of the world, the United States. In the course of this period, capitalism, nation-states and empires interacted with one another and were transformed. 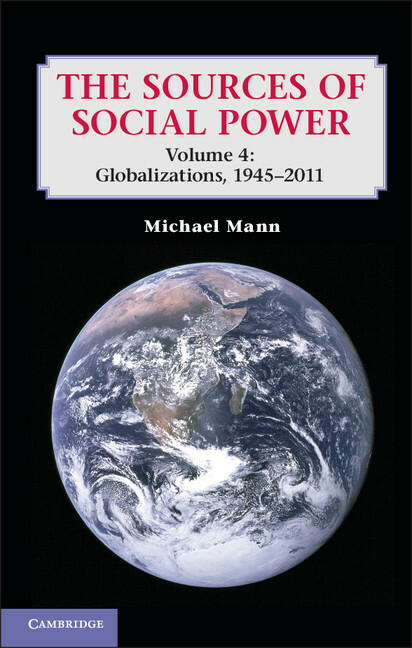 Mann's key argument is that globalization is not just a single process, because there are globalizations of all four sources of social power, each of which has a different rhythm of development. Topics include the rise and beginnings of decline of the American Empire, the fall or transformation of communism (respectively, the Soviet Union and China), the shift from neo-Keynesianism to neoliberalism, and the three great crises emerging in this period – nuclear weapons, the great recession and climate change.